Fly anglers can appreciate big fish, big water and big tackle. But they can also deal with and relish small water and delicate presentations. Sage’s Dart series of fly rods, new for 2019, are the lightest, most precise-casting small-water rods ever made, the company says. The poles are meant to fish small, still, clear water, like a small, slow stream, in close quarters with small flies. The rods are intended to drive precise casts under vegetation like the branches of a tree along such waters. The 0- to 4-weight models are 7 ½ feet long and are the backbone of the six-rod series, Sage says. But a 6-1/2-foot 3-weight is also included. 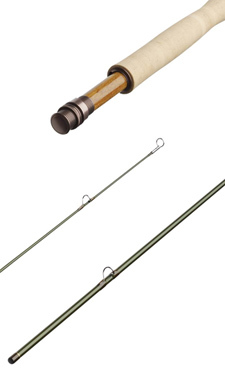 The rods are an attractive “sapling green” color with bronze and gold thread wraps and a verawood reel seat. This is a Sage, and it’s going to cost. For more details, visit Sage’s website.